No matter what fly fishing shop you go into or search online, there is always a huge selection of leaders and tippets on a large display case. If you’re new to fly fishing, looking at that giant rack can be a bit overwhelming with various manufacturers, types of leaders and tippet, and prices easily ranging from $2 to $25. With all the different brands out there the primary difference comes down to monofilament (mono) or fluorocarbon (fluoro). Knowing the differences between the two will allow you to choose the right material for your application. When I started fly fishing I used straight mono and still caught fish. I was primarily fishing for bass and panfish (bream), where the type of leader or tippet material is less important. In fact, when I was on a very limited budget throughout high school and college, I used to fish with mono fishing line that I would get from the large outdoor chain store in 100-200 yard spools. There are some lines out there that are very close to the diameter of fly fishing tippet. Personally, I choose fluoro for my nymphing tippet/leader material and mono leader/tippet material for dry fly fishing. However, I do not think that differentiating between the two is as important when you are starting out fishing. There is a lot to fly fishing and worrying about which line to use should not be a huge concern when starting out. If you’re starting out and on a budget, there’s nothing wrong with monofilament for your leaders or tippet. The biggest difference between mono and fluoro is cost. Fluoro is significantly pricier than Mono. For example, 25 yards of Mono will usually be priced between $4-$8. A 25 yard spool of Fluoro Tippet in the same brand will average between $20-$25. Fluoro is more dense than the water around it, causing Fluoro line to sink faster than Mono. This is very important when nymphing. By using Fluoro you will be able to get the flies down to the strike zone, where the trout are feeding, more quickly. Conversely, since the mono does not sink as quickly, it is a good choice when dry fly fishing. Another difference between mono and fluoro is line strength. Over the course of the day, mono will start to absorb water, stretches, and becomes weaker – in some cases up to 20% weaker. This can be the difference between netting that massive trout or going home to talk about the one that got away. Additionally, since the fluoro is more dense than the mono, it is more abrasion resistant. When you’re fighting that large fish that’s rubbing on rocks and logs, the fluoro is more apt to take the abuse. Have you ever grabbed your mono tippet and pulled on either ends to check to see if a fray is a weak point in your leader? Have you ever seen it stretch? This is common with Mono; it tends to stretch more than fluoro. This can be both an advantage and disadvantage when it comes to fly fishing. The stretch of monofilament provides an advantage when fighting a fish; it acts shock absorber when a fish makes an unexpected run or dive. The disadvantage comes in detecting a strike. Sometimes, due to the stretch, slight strikes are less noticeable. Fluoro has little-to-no stretch, which helps with strike detection. 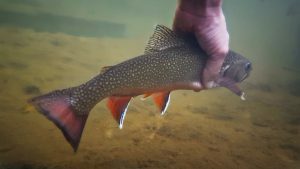 Trout are very sensitive to the environment around them. Ideally, leader and tippet materials should be as “invisible” as possible to the trout. The fluorocarbon is refractive, making it less visible in fresh water. Now that I have explained the difference in in leader and tippet material, I wanted to briefly touch on length and size to help you while you’re standing in front of that large display case with countless options. 99% of my leaders are 9 foot in length. If you want longer you can always build out your leader using tippet material. This saves you from buying leaders in all different lengths. I usually start off with a 4x or 5x leader. If I build it out from there I will go from 5x to 6x – on step down. For freshwater fishing, you can probably start with spools of 4x, 5x, and 6x tippet. As always we wish our anglers the best of luck. If there is a topic you would like to read about just let us know.